Basil is a classic and well-loved green herb with a bright fresh flavor. When harvested, you can use the basil immediately, dry it, or place it in vinegar. For an Italian treat, use basil to flavor olive oils and pesto. Don’t keep harvested basil leaves in the refrigerator or walk-in, or they will brown more quickly. To enjoy the best flavor payoff possible, add fresh hydroponic basil to your sauces or soups within the last few minutes of cooking. Cilantro, the fragrant herb found in Mexican and Indian cuisines, is instantly recognizable. This hydroponic herb looks like flat leaf parsley, but tastes vibrant and savory in a dish. To store cilantro, cut the stems and place them in water, removing any leaves falling below the water line. Change the water regularly, and, if you haven’t already eaten all of this delicious herb, you can enjoy it for up to 3 weeks. Parsley is a classic garnish thanks to its attractive dark green leaves. Parsley’s delicious flavor pairs perfectly with hearty dishes like meat, egg, potato-based dishes, and pastas. To store parsley once it has been harvested, wrap unwashed stems in a paper towel and place it into a plastic bag. For longer-lasting parsley that retains the same great flavor and appearance, try freezing your parsley. Thyme is an aromatic herb with a fresh and unique fragrance. The herb can be used fresh or dried for a higher level of potency. Thyme is a bright green herb that works beautifully in soups, stews, stuffing, poultry dishes, and casseroles. Its distinct flavor can survive long and slow periods of cooking. 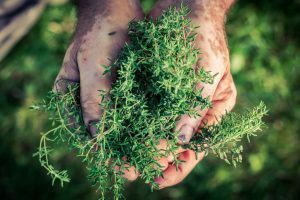 Once you get freshly-picked hydroponically-grown thyme from our farm, you can place it directly into your refrigerator or walk-in, dry it, freeze it, or preserve it in oil or vinegar. Baywater Farms is dedicated to growing high-quality hydroponic herbs on our sixth-generation family farm. While the hydroponic growing we practice is a modern method, we still harvest and care for all of our herbs and lettuces by hand. In our ½ acre greenhouse, we grow 24 acres’ worth of delicious, fresh Maryland produce using sustainable farming methods. Since our greenhouse is climate-controlled and carefully tended to, our hydroponically-grown lettuces, herbs, and microgreens are available throughout the year. Our herbs are just as sun-kissed and fresh in January as they are in July. You can find our fresh hydroponic herbs, cultivated using sustainable growing methods, in national grocery store chains, produce distribution companies, local restaurants, roadside farm stands, CSAs, and farmers’ markets. To learn more about our innovative growing process and ordering our fresh local produce, click here. Our excellent freshly grown hydroponics speak for themselves, and we know your taste buds will love to listen! Baywater Farms is a sixth-generation family-owned and operated farm servicing Ocean City, Annapolis, Laurel, Salisbury, and the Eastern Shore. Baywater Farms is capable of meeting the demands of your produce distributor, restaurant produce supplier, CSA produce supplier, or wholesale produce supplier while maintaining the integrity and character of a small farm. Baywater Farms is about more than just hydroponic lettuce—we also grow heirloom cherry tomatoes, eggplant, hydroponic microgreens, custom grows, fall squash, Maryland’s own fish peppers, and more. When you work with Baywater Farms, you work with an experienced, ethical, and local farm dedicated to providing the highest-quality heirloom produce possible.